The Persecution of Sarah Palin: How will it end? Joseph Goebbels (shown above on the right) earned a Ph.D. from Heidelberg University and worked for a time as a writer and journalist. He excelled at delivering anti-Semitic speeches, and in 1933 was appointed Propaganda Minister for the Nazi Party in Germany. 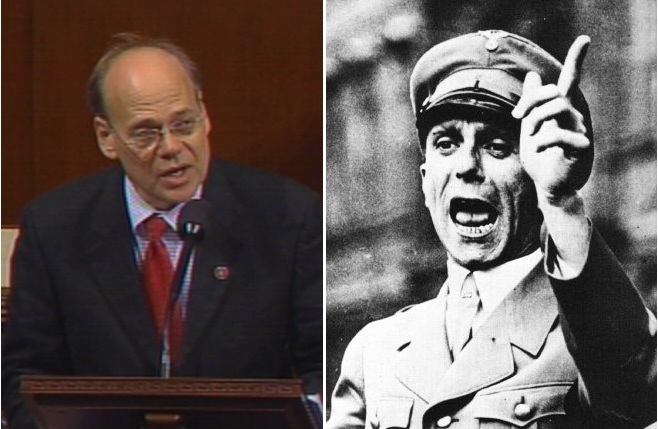 They say it’s a government takeover of healthcare — a big lie, just like Goebbels. You say it enough — you repeat the lie, you repeat the lie, you repeat the lie — and eventually people believe it. Like “Blood Libel” — that’s the same kind of thing. The Germans said enough about the Jews, and the people believed it, and you had the Holocaust. You tell a lie over and over again. Congressman Cohen (shown above on the left) represents the 9th Congressional District in Tennessee. This includes people in and around the city of Memphis. More than half the voters in that area apparently support his point of view and return him to office. I think Representative Cohen misrepresents the idea of the “Big Lie.” In Germany, it was used to foster the notion that people of the Jewish faith were “bad people.” With repetition, the idea became a part of the German belief system, and the mass killing of these “bad people” was deemed necessary. We have seen the “Big Lie” technique used more recently to justify the killing of Cambodians in the 1970s and the killing of Tutsis in Rwanda in 1994. It is an unsettling political tool. When you look at the “Big Lie” as a tool used by political leaders to marginalize a portion of the population, you begin to understand what Representative Cohen is doing. He expands on the Democratic Party theme that “Republicans are bad people” and moves beyond the “racist, homophobic, bigoted” characterizations into the even more disturbing area of “killers and liars.” This is the rhetoric that colors our healthcare debate. Representative Cohen paints Republicans as being bad people, and reinforces the “ghouls and sub-human” characterizations used by Keith Olbermann. Do you think Congressman Cohen senses the irony? He is our current manifestation of the “Big Lie” and yet he accuses his political targets of being the ones who use that tool. --Republicans are concerned about the administration of our nation’s healthcare system by government agencies. Republicans are also concerned about whether or not it is right to force every citizen to buy an insurance product, and whether it is right to allow our Executive Branch to grant legislative exceptions and waivers to favored entities. If Republicans are characterized as killers and liars, will their concerns be heard? --Republicans are concerned about the sanctity of our voting process and whether it is right to allow non-citizens to vote. If Republicans are characterized as xenophobic liars, will their concerns be heard? --Republicans are concerned that our climate debate is being influenced by data that is erroneously adjusted and by restricted views of that data. Republicans see the adjustments as skewing the data rather than normalizing it, and they see the restricted views as distorting the issue rather than clarifying it. If Republicans are characterized as non-conforming liars will their concerns be heard? While Representative Cohen feels comfortable in characterizing Republicans as bad people, this effort does not encourage the free exchange of ideas. Rather, it stifles debate. But then, that’s the idea. Our culture sees Republicans as a problem to be eliminated, and endorses the “Big Lie” as a valid tool in that effort. Recently, a Congressman from the state of New York resigned his office because of a public exchange he had with a potential sexual partner in Washington, DC. Chris Lee, the former Representative, is 46 years old, is married and has one child. Chris Lee is also a Republican. Linked by LeftCoastRebel! Thanks, Tim. Victor Davis Hanson has a compilation of some of the anti-Republican rhetoric of not-too-long-ago. Note that our culture has no problem with "civility" during a Republican administration. The point here is not that PolitiFact’s claim is a lie, or that PolitiFact is biased (although the latter is fairly obvious). Rather, the point is that the question of whether ObamaCare is a government takeover of the healthcare system is one of political opinion, not a simple question of fact. Yid with Lid takes offense at the characterizations made by Representative Jim Clyburn (D-SC). Congressman Clyburn seems to share the view of Congressman Cohen that Republicans are Nazis. Chris Christie is the most effective spokesman for Republican fiscal values I've ever seen, and I'm old. Maybe the country has heard the Big Lie from Dems for so long it's finally ready for some real reform. However, the Media hasn't been showing pictures of emaciated children and crippled old people yet, so who knows. Thanks for the comments and the interest in this subject. It's good to see that the Republican spirit is hard to break!